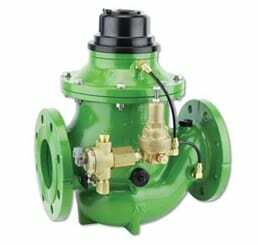 The BERMAD Model IR-920-MO-54-R integrates a vertical turbine Woltman-type water meter with a diaphragm actuated hydraulic control valve. As the system’s Flow Meter and Main Valve, it controls system irrigation together with the irrigation controller. The BERMAD Hydrometer reduces downstream pressure to a constant preset maximum. It is a Normally Closed Hydrometer, which opens in response to a pressure rise command.